Unfortunately, I am unable to attend the 350th Anniversary celebrations in Vancouver this Friday (Aug. 11th). The Sisters Of The Child Jesus had invited me to be part of the festivities back in May when the new icon of Anne-Marie Martel was unveiled at St. Thomas Aquinas High School in North Vancouver. I wasn't able to attend at that time either, the realities of an artist living hand to mouth. I had hoped that finances would make it possible a few months later, but no. I've extended my apologies to the Sisters, along with my congratulations on this momentous occasion. 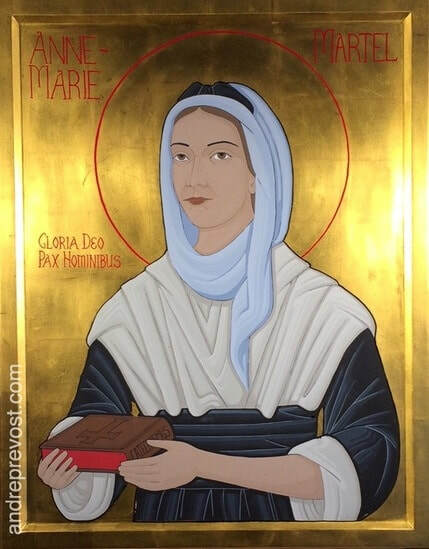 I will always cherish the great blessing of writing the new icon of Anne-Marie Martel, Founder of the Order. 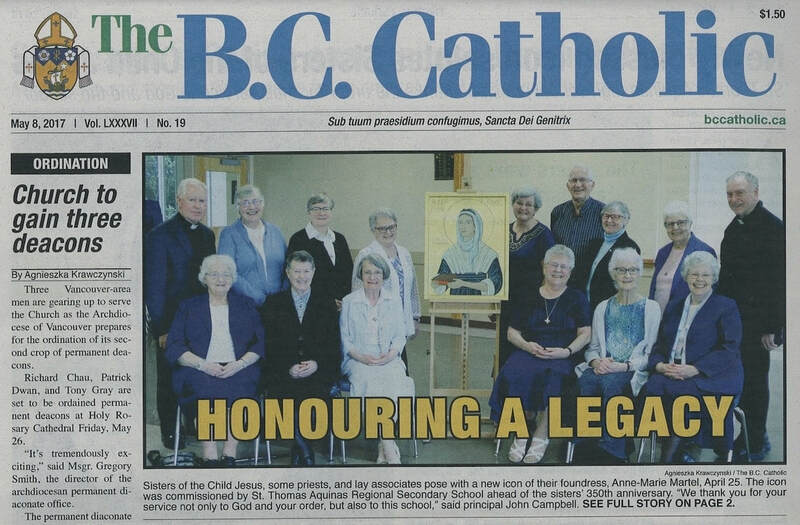 The icon was commissioned by St. Thomas Aquinas Regional High School in North Vancouver, BC. It will be installed in the Chapel. Last year, the school commissioned and icon of St. Thomas Aquinas, also for the Chapel. Got the 24K gold leaf applied on Wednesday, then added the inscriptions and halo yesterday. These needed to be done before i could seal the gold leaf (always a tentative process as the gold leaf easily scratches during this phase), so that the paint properly adheres to the metal leaf. I did seal the gold leaf last night and I now need to let it set for at least a day before I can continue writing the icon tomorrow, January 28th. was used in order to be inclusive of the Order around the Globe. Moving along with the new Anne Marie Martel icon. She is the Founder of the Sisters Of The Child Jesus. Much is left to do in the writing and the red bole is in place (where gold leafing will be applied later this week). I've only just started on the face and arm, with only one level of shading to begin developing the form, and won't be completed until after the gilding. Anne-Marie Martel was born in Le Puy, France in 1644, the daughter of a Magistrate, a position of affluence and prestige. She could have lived a life of comfort and privilege. Instead her short life was spent in an extraordinary expression of love and service to God. Her name was submitted to the Vatican to begin the process of beatification in 2005. 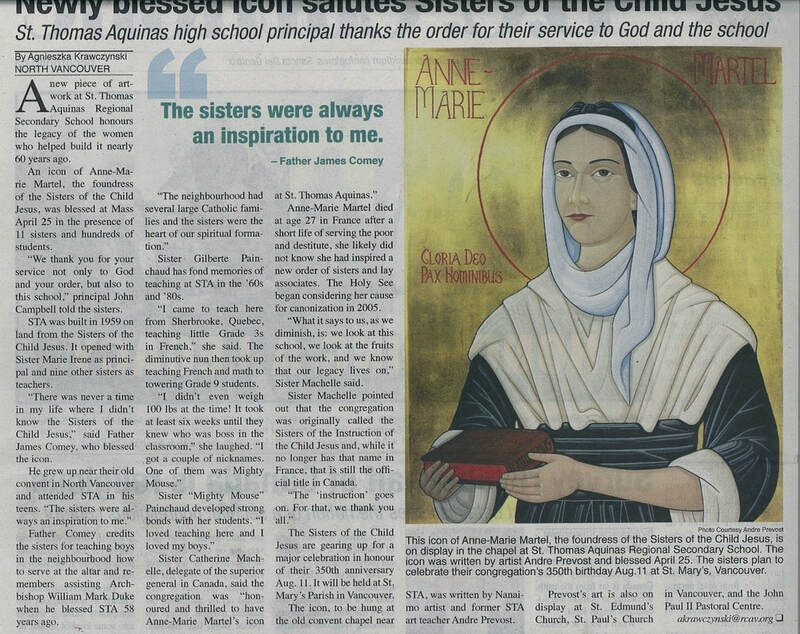 When she was only 21 years old (1666), Anne-Marie’s confessor, recognizing her exceptional devotion to God and knowing that she was well grounded in the doctrine of the faith, invited her to minister to the women in a small hospital for the destitute. Anne-Marie brought her burning desire to serve the Father to women who knew only physical and spiritual deprivation. She told them that each was beloved of God and taught them the fundamental precepts of the Catholic faith. Within a year, she was asked to teach catechism to street children. She was quickly joined in her work by others who responded to her passionate desire to serve God through love of the poor. The ministry expanded to the lace-makers of the area. Within three years these indomitable women were laboring throughout the city of Le Puy and many of the surrounding villages. Anne-Marie died in 1673 at 27 years of age without knowing that she had, in fact, founded a community of Religious women. The Congregation received official approbation in 1676, the name The Ladies of Instruction of the Child Jesus was adopted in 1708 and the first Rule was written in 1730. Just seven years of active ministry – 1666 to 1673 – and yet in this short time, Anne-Marie Martel’s life had an impact that is still echoing throughout the world. One has to improvise with the space that one has or hasn't. 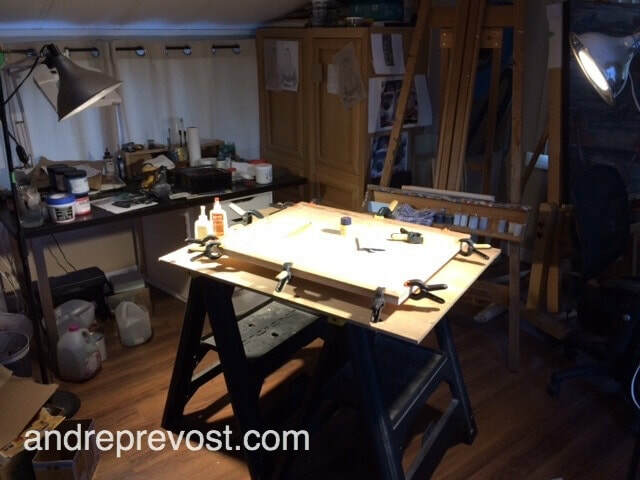 The lifelong quest has been to improve my studio and work space, while the reality has gone the other way. So welcome to my studio/living room space! Every step requires moving things around. Adhering the muslin onto the frame and board, working out the air pockets. 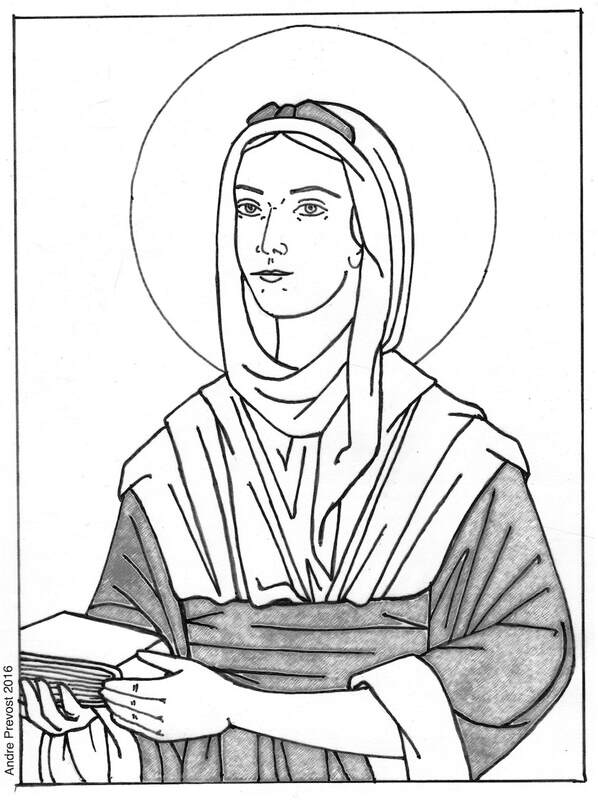 The design for the icon of Anne Marie Martel has been approved. The icon will be going into the Chapel of St. Thomas Aquinas Regional High School, but it was also important to include the Sisters Of The Child Jesus in the design process, especially with there being so few images of their founder. There are always adjustments to be made once the image is transferred onto the prepared icon board. But first things first. 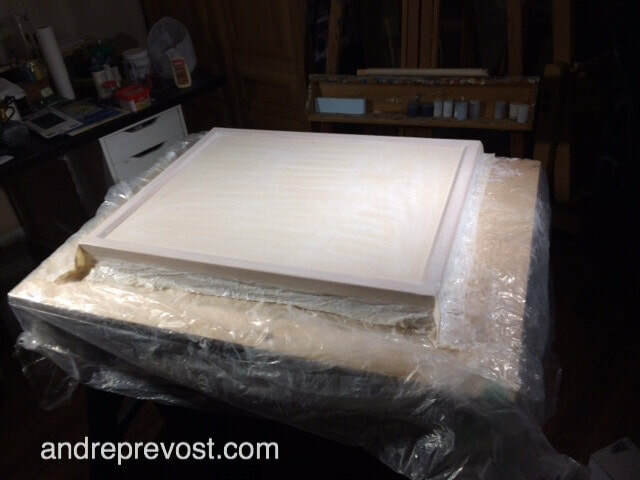 The first step is to get the icon board constructed and prepared with muslin and gesso. I'm pleased to say that I've received another icon commission, and as has been the pattern, with a new original journey of discovery. I've been asked to write another icon for the Chapel of St. Thomas Aquinas Regional High School in North Vancouver, BC. 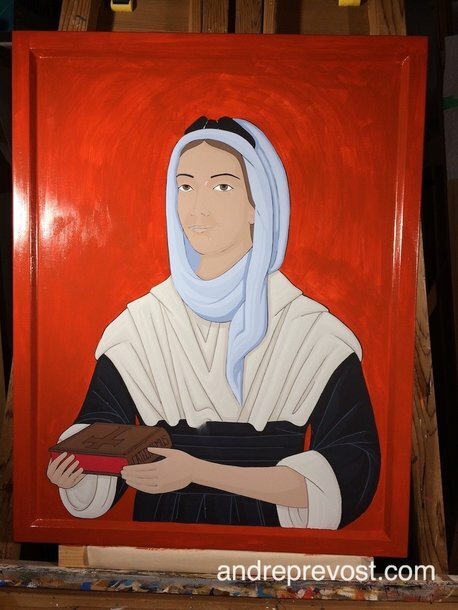 This icon will be of the founder of the Sisters of the Child Jesus, Anne-Marie Martel. The Order has had a long connection to the school, and its convent was situated next door. In recent years, the school has expanded to include the Convent. There is only one official portrait from to 1600s for Anne-Marie Martel, signed by the Bishop at the time, and which the Sisters Of The Child Jesus had found and embraced as the image of their founder. It isn't a refined portraiture but it is the only one that was painted almost immediately following her death. There were two other paintings of her at a later time but they both went to a stern religious format which has little bearing to the original signed by the Bishop. She is not known as Sister Anne-Marie Martel because "she died before knowing that she founded a religious congregation" (Sister Denece Billesberger). my task is to remain true to it, and hopefully bring it to a level which is pleasing to both the Order and St. Thomas Aquinas High School.